The Rhode Island shark cage diving boat, “Snappa” has been involved with the National Marine Fisheries Service Shark Tagging Program since 1976. Results from our tagging provide useful information concerning feeding, reproduction, growth, and migration habits. Of the 2,538 sharks that have been tagged and released, 252 have been recaptured. 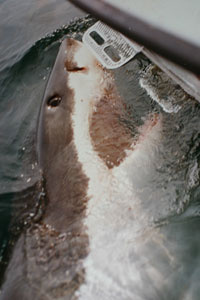 Our most notable tag releases were from a 20 ft. Great White shark weighing approximately 4,000 lbs. and a 5 ft. Great White shark. One being the largest and the other being one of the smallest Great Whites ever released for the N. M. F. Shark Tagging Program. A number of our sharks have been at liberty for as long as 12 yrs. prior to recapture. Notable returns have come from areas as distant as the Gulf of Mexico, Venezuela, the Azores, and off the west coast of Africa near the Cape Verde Islands some 2,700 miles away. The types of sharks one may encounter in Rhode Island waters include the Dusky, Blue, Thresher, Mako, Basking, Sandbar, Great White, Hammerhead, Porbeagle and Tiger. Recognition has to go out to all of my shark cage divers and sport fishermen who have unselfishly joined the path of research and preservation of one of nature’s most beautiful creations, the shark. Without your cooperation none of the information that has been gathered would have been possible. A big thank you goes out to all of you. As many of you are aware of my involvement with the National Marine Fisheries shark tagging program, I would like to inform you of our latest venture. On September 11th 2015, the crew of the "Snappa" teamed up with the Guy Harvey Research Institute. Professor Brad Wetherbee from the University of Rhode Island joined us hoping to catch, tag, and release a mako shark for scientific research. I'm excited to say that we did locate a 5ft mako shark. It was brought aboard the boat live, and release with a $2000 satellite tag attached to the dorsal fin. From the tagging location 20 miles south of Pt. Judith, RI the shark traveled toward Martha’s Vineyard, then out to the canyons straight south. It then zigzagged east and west to continue toward New Jersey, Maryland and then to an area 500 miles Northeast of Bermuda. From there it began its track back to Maryland, finally returning back to RI water within 10 miles of where it was originally tagged. After observing 13 months and 6900 miles of real time migration, the batteries in the tag ran out of power. If anyone would like to follow the migration routes of the 3 sharks we have tagged, click on the link below and follow the directions listed. The sponsors for our sharks are Yacht Chandlers 2, Show Management and Sea World 3. For anyone who would like to join us on a “Mako Shark Tagging Satellite Expedition”, we are reserving dates of August 8, 16th and 24th for this adventure. The length of day will consist of 9 hours, meeting at 7 AM with our return to the dock around 4 PM. We will be fishing within 25 miles from land. Participation from all who attend these trips is highly requested. From catching the sharks on rod and reel to assisting us in tag placement, any cooperation will be appreciated. The cost per individual will be $175. Reservations are required in advance of these dates. 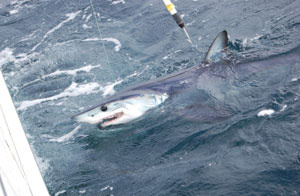 The mako shark is the only shark that will be tagged with a satellite tag. Other species of sharks we may encounter include hammerhead, sandbar, basking, thresher, and blue shark. These sharks will be tagged with the National Marine Fisheries Service shark tags. Other species of marine life that may be seen include whales, pelagic birds, Portuguese Man-of-War, sea turtles, ocean sunfish, and porpoises. All participants will have their name associated with any tags attached to the sharks. Upon recapture, all will be notified as to the location and time of the recapture. 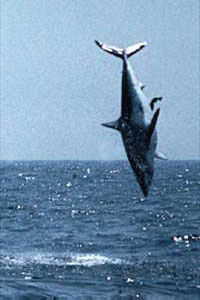 All mako sharks that are tagged with a satellite tag can be followed on the internet on a daily basis. To track the shark, follow these directions.